Writing My Way Back Home As I write this, it’s mid-September, and if I were back in Pennsylvania, where I grew up, there would already be a bit of a nip in the air. Instead, here in Florida, it’s still hot and humid, with temps in the eighties. Is it any wonder I like to return, in my head, to that small town where I grew up? Suburbia and rural countryside live side by side in Bucks County. I grew up in a suburban neighborhood about a mile from the small town of Yardley. The population of our township then was about 10,000, with another 5,000 in Yardley itself. Though the population has grown, you can still travel from the Victorian gingerbread of downtown, past the suburbs built in the sixties and seventies, and then out into the countryside, where colonial-era fieldstone farmhouses still remain, dotted between newer developments of big houses and even bigger yards. This is the area I write about in my golden retriever mysteries. I created a small town of my own, Stewart’s Crossing, and placed it just upriver from Yardley, between there and Washington’s Crossing, site of our first president’s Delaware adventure on Christmas Eve 1776. I like to mix in the old downtown, the suburbs and the farmlands, and to portray a place with a lot of history—both national and personal. One of my favorite parts of autumn growing up was the Yardley Harvest Days Festival, and the flea market held on the grounds of the Friends Meeting House, on Main Street just beyond the old mill pond, now called Lake Afton. More than just a collection of used stuff, it was a way to reconnect with neighbors and friends, to help out local charities and celebrate the yellow and gold leaves of the towering maples and oaks that ringed the property. The plain one-story meeting house transformed into a makeshift kitchen, where you could buy hot dogs, hamburgers, and Pennsylvania Dutch-style funnel cakes. Pick a homemade brownie or chocolate chip cookie for dessert from the bake sale and wander around the makeshift maze of tables displaying antiques, hand-crocheted tea cozies and old tools salvaged from someone’s garage. Of course, there are always secrets lurking behind the shadows at the edge of the lot—every town, no matter how large or small, has them. And in my books, all it takes is a divorced guy with some computer hacking skills and a very curious golden retriever to unearth them. 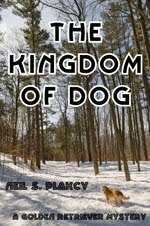 Neil Plakcy’s golden retriever mysteries were inspired by his own golden, Samwise, who was just as sweet as Rochester, though not quite as smart. And fortunately he didn’t have Rochester’s talent for finding dead bodies. 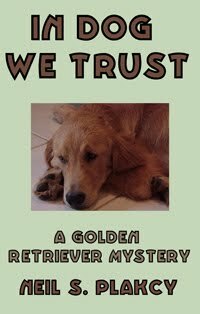 Now that Sam has gone on to his big, comfy bed in heaven, his place by Neil’s side has been taken by Brody, a cream-colored golden puppy with a penchant for mischief. 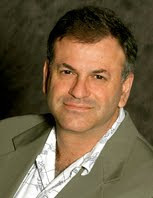 A native of Bucks County, PA, where IN DOG WE TRUST, THE KINGDOM OF DOG and DOG HELPS THOSE are set, Neil is a graduate of the University of Pennsylvania, Columbia University and Florida International University, where he received his MFA in creative writing. He has written and edited many other books; details can be found at his website, http://www.mahubooks.com. Neil, his partner, and Brody live in South Florida, where Neil is working on a fourth mystery, and Brody is busily chewing something. I bet you are glad you are not in Pennsylvania today, with Sandy causing havoc. I like mysteries with dogs in them. I hope I win a copy of your book. Thank you for the memories...I always loves the fall (Harvest) festivals in our hometown growing up also. I do not get to go to many things like that these days, but my memories serve me with a smile! Now I know where to find Stewart's Crossing. 'Fraid if I win I'll need #4 since I've read the other 3. Thanks for the great stories. Thanks for the comments, everyone! And Theresa, I'm just starting revisions on number 4-- my critique group is reading chapter by chapter, and I hope to have the book out in early 2013. Also just started work on number 5, and I'm having lots of fun researching Quakers in Bucks County and their role in helping young men in the 60s get to Canada to avoid the draft. I am so softhearted about my dogs . . . your series sounds great. Neil, I love the series and I'm looking forward to more! Your books sounds very good, look forward to reading them. Hi Neil - I grew up in NY and enjoyed reliving my own autumn memories while reading your post. I love mysteries, especially ones with animals. Look forward to reading your golden retriever books.